The favorite food of the former owner of this house must have been mushroom soup, because she painted every room either a light or dark shade of browny-gray mushroom-soupiness (except for Child Two’s room, which was bright red, and the kitchen, which is a dark gray). Now I know that mushroom soup is a trendy color, but when you live in one of the rainiest parts of one of the rainiest areas in the country and there is a forest in your backyard and when your whole house is this color, it gets somewhat overwhelming (not so overwhelming, though, to make me get around to painting more than a couple of rooms). When I chose the color for my office, the coldest one in the house, I wanted something that at least looks warm. And I got it. Instead of the Tuscany gold promised by the paint chip, my walls turned out to be California poppy orange. It was a shock at first, but I loved it because (a) it’s bright, even on the dullest day and (b) I’m from California. Abandoning the calm Tuscan-inspired décor I’d envisioned, I’ve gone back to my roots and am slowly but surely putting together a fun, bright environment in which I spend the bulk of my day reading other people’s blogs working. Last year I painted an ugly old metal filing cabinet bright red. This was my first attempt at spray painting (not a success) and then at brush painting metal and involved lots of whining to Hayley and hard lessons about paint and humidity (see “one of the rainiest parts of one of the rainiest areas in the country” above). Thank goodness Hayley is a goddess of painting and could help me even from 1200 miles away. I love this cabinet now and I’m covering one side of it with tacky, touristy magnets like you’d find in a beach-town souvenir shop. Needing another bulletin board (because you can never have too many), this one to help me in my never-ending struggle to not overschedule my work, I started with an old one I happened to have lying around in our storage room. I sanded and painted the frame with some red acrylic craft paint I happened to have lying around. I pondered for a while about what to use to cover the faded and cracked (and now paint-splattered, because I am not a neat painter) cork. I finally decided on some used California road maps I happened to have lying around. They weren’t the right dimensions, so I cut them into pieces and did a collage kind of thing. I printed up my current and upcoming schedule as well as lists of things to do for two long-term projects I’m working on; the yellow paper I happened to have lying around, left over from printing handouts for a children’s writing workshop I taught in a few years ago. I have lots of room for other schedule-helping notices (like a big sign that says “Just say no!”). The whole project, then, was completed with things I happened to have lying around (the sheer variety and volume of which is scary), except for the hangers on the back. We probably have some of those lying around too, but finding specific tools or pieces of hardware is a major and sometimes dangerous undertaking here (I will say no more on that topic) so it was easier to buy some. I’ve got other ideas for covering the cork when the maps get too full of holes: magazine pages, pictures from old calendars, scrapbooking paper (of which I have a big boxful, although I don’t do any scrapbooking), blown up photos. I may do a board for over my sewing table using old patterns. For my kids, both musicians, I could use sheet music. 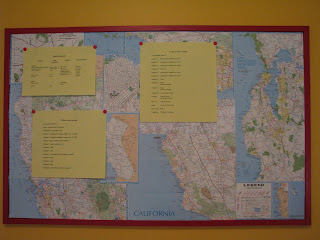 And yes, I do happen to have all of the stuff, including at least a few more old bulletin boards, lying around. Love, love, love the maps! And the red against the poppy orange wall. Way to go! Love the orange Susan! One of my favorite colors. Bright colors can sure liven up the mood. I need more bright colors myself. Hayley said "conservative" when she saw my house. Code for BORING!!!! Good luck with your creative endeavors. If you need more scrapbooking supplies, I have drawers full! Great California theme. The maps look fabulous. I'm thinking of making a board covered with fabric. I also like your stitch markers a lot. I've been knitting for 20 years and never knew about stitch markers until I came across Heather's idea. Now I can't close a round without one. I also like the kind that she made with the bar part of a toggle. That was really handy when I was working with a embossed stitch pattern. I'm looking forward to your next project.